Though still closely associated with New Labour, the Fabians today are a broad-ish church: sharp suits and young volunteers with a clear West Wing jones still outnumbered trade unionists and CND vets at the Institute of Education, but not by much. The lineup of speakers was somewhat less diverse, sticking largely to familiar faces from the centre-left; Caroline Lucas and Lord Oakeshott were the only parliamentarians in attendance not to represent the Labour Party, and similarly the media commentators were primarily drawn from the ranks of Guardian stalwarts, with Polly Toynbee, Sunny Hundal and Neal Lawson all present. Shadow Chancellor Ed Balls had make his task of opening proceedings considerably harder by announcing the previous evening that Labour would not commit to reversing any of the cuts made by the coalition government. 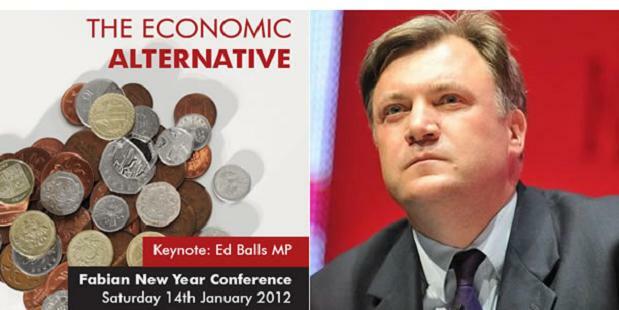 Given that the heading of the conference was ‘The Economic Alternative,’ what was put on offer by Balls was desperately thin. Amidst a lot of rhetoric about ‘credibility’ and crowd-pleasing invocation of Keynes, it was painfully clear that his strategy was simply to wait until the public ran out of patience with Osborne and co, while he and his party continued to criticise the pace (but not the necessity) of cuts from the safety of the opposition benches. That the Fabian audience met this with mere frosty applause is perhaps indicative; the response from unions in the last few days has been far more robust. This is, of course, to be expected. Trying to appease one’s base at the same time as accumulating enough wider public support to win an electoral majority is hardly a new problem for a party in opposition. The key point here however is that this is, as Balls and numerous others over the course of the day observed, an atypical historical moment. Time and again, the elections of 1979 and 1945 were invoked as sea changes in the national and international political landscape, points where the agenda could be set for decades to come. After the considerable national and international upheavals of the last year, it’s a reasonable hunch that the subsequent election could prove similarly important in determining the future of progressive politics in this country. Amongst all the stirring words about seizing the day and the left keeping its collective political nerve, there were some frustrating and troubling implications for what this meant for Labour’s engagement with both its own left wing and the wider public. A panel discussion comprised of MPs Chuka Umunna and Caroline Lucas, Compass chair Neal Lawson, focus group guru Deborah Mattinson, and former Economic Secretary to the Treasury Kitty Ussher best exemplified this. After Lawson had won some easy applause by appealing for a return to the language of solidarity and socialism in rebuilding Labour’s electoral appeal, Mattinson and Umunna argued that such language had no appeal to the voter on the street, and that to readopt it was to abandon the field of ‘mainstream’ political discourse entirely to the Tories. Even if this is true, which Lawson and others disputed, one had to wonder: well, whose fault is that? Whose responsibility is it to make the case for community solidarity and, whisper it, socialism, if not yours? If the stakes are as high as everyone keeps on saying they are, shouldn’t the putative alternative be couched a bit more forcefully? Umunna is right to say that progressive politicians should be speaking outward rather than preaching to the choir, but there’s little point in doing this if it means operating within the parameters of an agenda set by the partisans of neoliberalism. Hand-wringing articles about the left’s general inability to gain ground in the wake of the 2008 crisis have been ten a penny across the blogosphere for some time now, but a solution that means only fighting on the right’s terms doesn’t feel like much of an alternative at all. Needless to say, Lawson and Lucas got the loudest cheers inside the hall, but it remains to be seen how far their arguments will win favour elsewhere amongst the political classes, let alone whether they will have the chance to reach the wider electorate. Other talks on the day were more heartening. A panel organised by the Fabian Women’s Network explored the gender implications of the cuts. While it’s a commonplace that bears repeating that reductions in funding to public services affects women disproportionately, a number of other salient and perceptive points were made: the ongoing gender imbalance in the upper echelons of banks and blue-chip companies since 2008 was discussed, as was the growing perception, particularly strongly felt in the audience, that the cultural profile of feminism was in a state of regression. There was an echo here of the left’s perceived failure to take advantage on the crisis in capitalism – why had things seemingly got worse since the seventies? Despite this frustration, it was an encouraging sign that so many women from across so many demographics were keen to discuss possible solutions from the floor. A second panel, ‘What should today’s young people want from a fairer capitalism?’ did engage, albeit awkwardly, with whether there was necessarily a consensus that young people wanted capitalism per se. This contained a particularly interesting, if unfortunately time-constrained, contribution from University of Sussex economist Mariana Mazzucato, in which she argued that the state’s role in enabling and funding research into cutting-edge technologies had been consistently and deliberately underplayed by the companies that profited thereby; these were some important points, and it was unfortunate that the format dictated they could not be built upon in greater detail by the audience and panel contributors. And, rounded off with a meandering call from Ken Livingston to man the barricades against Boris Johnson (or Thatcher – his speech had an endearingly atemporal quality), that was it. I suppose it would be ambitious to expect anything too daring from any of the Labour affiliates here; all those present seemed quite happy to wait for public sympathy with the Tories to erode until the time came to impose slightly different austerity measures of their own. And while Balls and Miliband might be now be spoiling for a chance to show the general public that the unions don’t call their tune, they were hardly going to play that card here. You can’t help but wonder, however, if the grass roots of the party will share the view of many in attendance that such a strategy really does represent an opportunity missed. It’s sad to see Labour floundering over their leadership’s unwillingness to abandon neoliberalism. They were founded by workers to be the political arm of the working class, so the current cabal of wretched post-Thatcherite flunkeys is depressing and infuriating in equal measure.